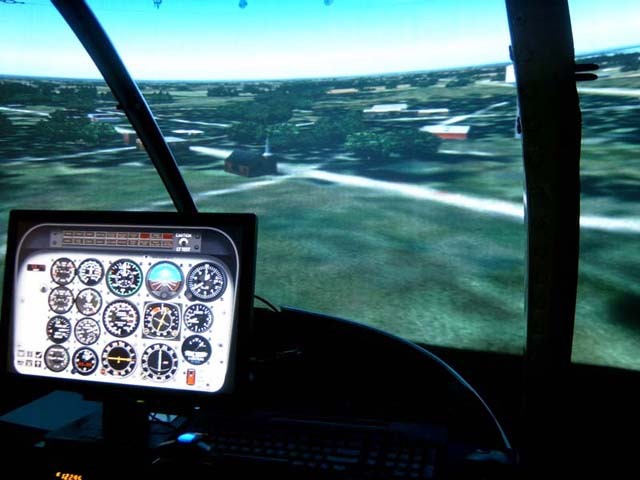 With modern off the shelf PC technology and flight simulator software, it is possible to build your own, high quality, helicopter simulator. In these pages you will find a lot of ideas, guidelines and possible setups to give you a head start. Building your own simulator is a lot of fun, instructive, and much cheaper than buying a certified device (which is very expensive). 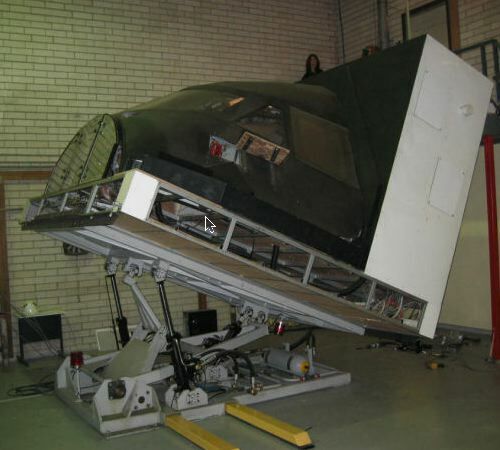 A well built DIY helicopter simulator can match the performance of its professional counterparts. This page is produced with three main issues in mind. Firstly, the requirements for building a basic flight simulator device by putting together software, a PC, a graphics card, a screen and controls. The second aspect concerns the enhancement of the flight experience by providing several hardware and software extensions. The final element is the desire to stick closely to the categories of flight simulator devices defined by the authorities. This page is, therefore, structured like the official Flight Simulator Devices (FSD) types. As always, our focus is on helicopters, although the simulators described are also fully applicable to aeroplane flight simulators as well. 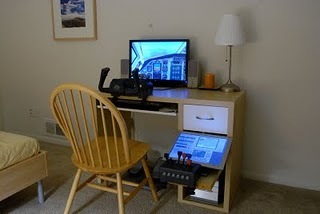 This is the basic setup that is used by a lot of flight simmers. It is comprised of a PC, a screen, and input controls. 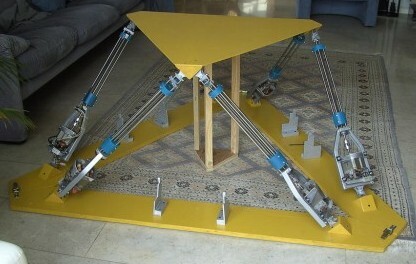 It is typically built around a normal 'chair and table/office' configuration. Such a device, when constructed with the appropriate input controls and high quality parts (pc + sw), is already an effective training tool! So, let’s have a look at what is needed to build this device. The heart of the flight simulator device is the PC. There are two important matters to consider here. Firstly, is the system properly balanced? This means that the performance of all of the individual components must be at more or less similar levels. For example, it makes no sense to use the fastest CPU with a moderate hard drive, or a high end graphics card with a dual core 2Mhz CPU system. This can't be stressed enough, because flight simulator performance needs all of the critical components to perform well: CPU, RAM, hard drive, graphics card and power supply. The second thing to consider is planning for the future. If you are starting with a basic setup, then it is a shame to discover (after a while) that adding that second screen reduces the overall performance way below acceptable limits. So, you should perhaps consider your PC configuration with the future in mind. One effective strategy is to buy a PC with enough extension slots and a power supply with enough room for them. Also, choose a 64 bit operating system instead of a 32 bit one, so that you can expand the RAM beyond the 4GB limit of 32 bit systems. All of the relevant items to be considered when selecting a PC with a graphics card appropriate for flight simulation can be found on grahics card 'introduction' and 'architecture'. This is not a particularly difficult aspect for a BITD as you can use generally available spring based controls. For our Helicopter Training Device, we need a good joystick as a cyclic control and some form of collective control. There is, however, one critical item: the pedals. They are mandatory, otherwise the BITD will not be realistic when it comes to helicopter flying. Research has also shown that by only using visual cues, a simulator is an effective training device when it comes to learning to control your heading while in a hover by applying appropriate pedal input. Accordingly, you really can’t do without them. For the more important aspects of input controls and information about a selection of them, visit the input controls page. Not all displays are appropriate for simulation purposes. However, the selection process can be straightforward and more information can be found on the page about displays. Sound is an important element for a convincing flight experience. Some add-ons are very good at simulating noises like blade slap, overstressed gears, warning signals, etc. As a general rule, the speaker set is more critical when it comes to sound quality than the applied sound card. Note that the Microsoft Flight Simulator X supports the use of multiple sound cards. One card is used for environmental noise (wind shear, engine, buttons, warning signals, etc.) and feeds the speaker system. The second sound card is used for ATC. The headphones are connected to this card. This effect can also be achieved by using a USB headset. Because the OS will see this headset as a separate USB device, you can connect the ATC traffic control program (which is separate from your flight sim software!) to the USB headset device. The card is used for the flight simulator sounds over your speaker set. Of course, all of the exciting hardware we have been discussing is of no use unless there is software to bring it to life. Basically, there are two choices: FSX or X-Plane. The decision is yours, because you can build very good simulators with either package. By the way, because purchasing both the X-Plane and the FSX won’t break the bank, you can also use both packages, as quite a lot of simmers do. There are two things that are worth considering in more detail: the quality of the helicopter model and the support for multiple views. To start with the former, X-Plane comes with a more realistic helicopter flight model. This is because it doesn't use equations to describe flight dynamics, but instead utilises a finite number of areas with aerodynamic forces acting on them to actually simulate the interaction of moving surfaces in the air. Without going into detail here, the bottom line is that X-Plane gives you realistic helicopter flight dynamics, while FSX provides you with an easier flight experience. However, FSX can be extended with an excellent add-on, the Dodosim Bell Jetranger, which also makes it very realistic in terms of its flight dynamics (and a lot more). The only drawback here is that it is available for only one helicopter model. So, as stated earlier, the choice is yours. The other issue is multiple monitor support which is dealt with in section 3.2, multiple views. For a comparison between flight simulation software packages, take a look at the Helicopter Simulation Software Overview page. The easiest set-up is built around a normal table/chair combination (a typical home office configuration). The PC is installed in a convenient location and the display and joystick are on the desk, and the pedals on the floor. As you can see, there is very little difference to a normal (office) PC workspace. A possible modification is to use a second screen solely to display the instruments, which will give you a straightforward view. This instrument display could be placed in a pilot friendly position. Note that a second view upon which to display the instruments doesn't use much CPU power, due mainly to its static appearance (X-Plane doesn't really support this possibility). Also, to make it more realistic, some effort could be put into creating a more 'cockpit'-like set-up. 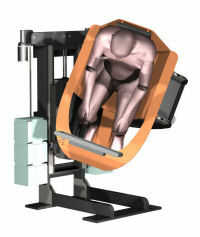 For example, using a gaming flight seat. An important factor when creating a flight simulator with a good performance level is the fine-tuning of the software settings. The single, most important value when it comes to measuring performance is the number of frames per seconds (fps). This should be around 30 to give you a good quality simulation. The key to achieving high performance is to experiment with the relevant settings and understand what they are doing. You can find some guidelines about how to improve system performance on the flight simulator performance guidelines page. The difference between a BITD and an FNPT is the 1:1 scale mock-up of the cockpit and the use of input controls that accurately resemble the real ones. There are two types of FNPTs, one that resembles a specific aircraft make and model, and one that is like a class of aircrafts (for example: piston helicopters, or turbine helicopters, etc). The cockpit mock-up is a project on its own. The level of detail you want to achieve is a matter of personal taste and also depends on whether you want to choose to mock up a specific make and model. There are complete mock-ups for specific models, but they are very expensive ($20,000+). You can, however, buy several parts, like overhead panels, radio stacks, and gauges that are especially designed for simulator use. These devices connect with a USB to the flight PC and can thus be easily used with your flight sim software. You will also find that there are welded tube frames that can be used as the basic cockpit. An FBNPT can be achieved with one (or more) LCD display(s), or with a projector to create an out of cockpit view. 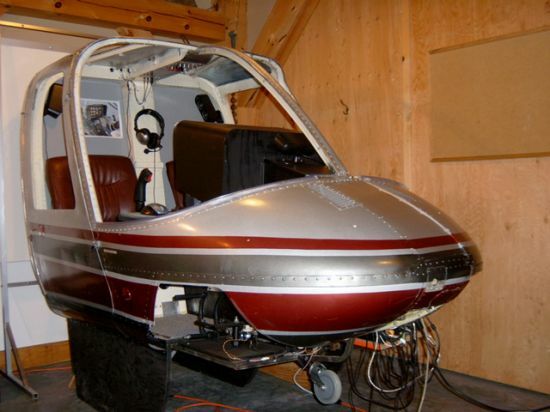 A very different approach is to buy a real (fuselage and / or) cockpit from an obsolete helicopter (try helicopters at eBay). It should be separated from the fuselage and completely stripped down. This empty cockpit is then used to build the instrument panel with its gauges, several panels, and the input controls, etc. Ideally, this kind of set-up also uses projectors to achieve an out of cockpit view (section 3.3). Note that stripping a real cockpit down can be a very time consuming project on its own! On the other hand, it will give you a very accurate 1:1 scale model of a specific helicopter make and model. This is a critical aspect when it comes to helicopter simulation, because there aren’t many products on the market, especially when it comes to the collective and cyclic controls. There are some good tools available, but they are very expensive (and mainly used in certified simulators). Many simmers treat the collective and cyclic controls as a separate DIY project. Pedals are the exception, with some good quality products available at a good price (pedals section). These are also essential parts when building a true FNPT. Fortunately, there are some good products available that all connect with a USB to the PC. With these items, you can fulfil the requirement of having a realistic instrument panel, instead of using a simulation displayed on a monitor. Because instrument panels take up a lot of display space, using real instruments will also free up your display: you will be able to have more outside views! And you won’t have to control switches with the mouse anymore, but can instead use real ones. 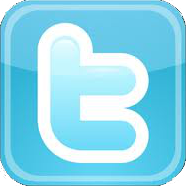 For a quick start, take a look at the Flight Instruments’ page. The set-ups from the previous sections can be extended with the following options. Use add-ons to create your favourite scenery, aircraft models and traffic. As already pointed out, if you are serious about using flight simulation as a helicopter training aid, you must consider using the DodoSim add-on (when using the FSX). You will find more general information about add-ons on the flight simulator add-ons page. One of the most convincing extensions enables you to create more views than simply forward. Note that we are talking about views and not displays, as these are two different matters. It is still possible to have a two or three display system with only one forward view. And you can also create three different views (for example, forward, left and right) on one display (you can easily try this yourself). Of course, there is a good reason to make the distinction between view and display. A view uses a lot of computer power if it is to run at a decent frame rate. If you create a second view, the need for power doubles. A third view triples this (assuming that the resolutions at which the views run are all the same). So, a decent frame rate of 30 drops to a useless 10 when using three views. Using three screens with one view will have no consequences for the frame rate (as long as we don't change the view's resolution). Of course, in this case, you only get a much bigger screen to watch it on, but no more details or a wider view angle. If what we are looking for is a wider view angle, then we need multiple views and they have to be implemented with two or three displays, each showing a different view. Now it is time for us to take a look at how the two most important software packages treat multiple views. In FSX, multiple screen support is easy, and can be accomplished with only one PC with the correct number of graphics cards (e.g. four screens means two graphic cards). The set-up is easy: configure the graphics cards and screens in the Windows Configuration Panel. Then, in the FSX, you can create several new views (from the main menu), each with its own view angle, and drag them to the appropriate displays. That’s it! With X-Plane, the basic design is fundamentally different. Instead of a single PC based solution, multiple screens require multiple PCs. This design is used to keep up with performance requirements. 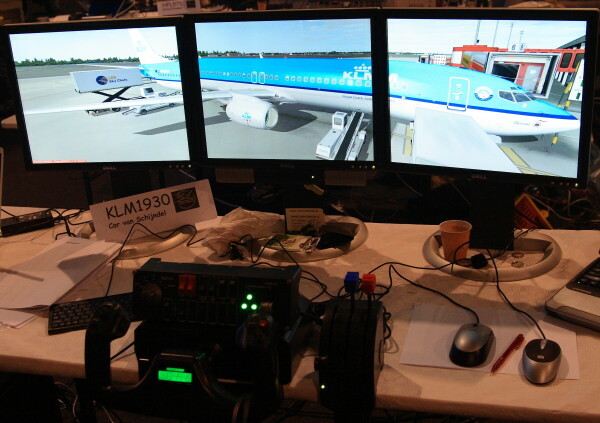 So, be aware that if you want to use three screens with different views, you must also use three PCs, which are interconnected via a network (LAN, messages via UDP protocol), with each PC having its own copy of the X-Plane installed. 3.2.2 Is there really a difference? So, at first glance, there is a big difference between FSX and X-plane in how they support multiple views. With FSX, you get multiple monitor support based on a single PC solution, while with X-Plane, you get multiple monitor support by only using one PC per monitor. The PCs are connected through a network and each one of them must have a copy of X-Plane installed. Obviously, there can be a different solution with some hardware and budget consequences. But the idea of using a single PC for each display is not unusual, because it helps to keep up frame rates with multiple views. This is also the main drawback with the FSX’s one PC solution. You need a very, very powerful machine, and will probably suffer frame rates that are much too low when using multiple views in this way. Also note that the frame rate dictates the number of simulation runs per second. So, where does this leave us? With FSX you should probably also use one PC per display if you want multiple views while maintaining acceptable frame rates! It should not come as a surprise that there is an add-on for FSX which implements multiple views with multiple PCs (each PC should have a copy of the FSX installed) that are connected through a network, similar to the X-Plane solution. You can find this at Wide View. First of all, when practising hovering in a helicopter, peripheral vision is critical. It is also well known that in simulators peripheral vision is the most important parameter when it comes to training effectiveness. So, multiple views will help you, especially in terms of helicopter flying. Helicopters are also known for their superior wide (cockpit) view when compared to aeroplanes. These are, therefore, reasons enough to consider implementing multiple views. When implementing more than one view, you will have to use multiple displays or projectors. To get a homogeneous result, it is important to use the same make and model of display or projector system, or you will get colour differences which can destroy the notion of one large viewing area. When using a projector system, be sure that you have enough room at your disposal. It is best to do a sketch and then check the minimum throw/distance the projector must provide, before actually buying one (unless you have plenty of room). Another extension to your simulator which gives a big 'wow'-effect is the use of a projector. This will do two things: give you a really large viewing area and an out of cockpit view. Both create a more realistic flight experience. Not all projectors are suitable, so some research is necessary. The relevant selection criteria are dealt with on the projector introduction page. A projector system still isn't the same as getting a wider view angle, which can only be realised with multiple views (see the section about multiple views above). However, implementing multiple views with projectors and a cylindrical view screen (180 degrees divided by three views of 60 degrees each) provides the best of both worlds: a surround view and the big wow-effect. A cylindrical view screen (or a spherical one) is supported by the software settings of X-Plane (projection and alignment options), although it requires a level 2 key (approximately $500). With FSX projectors should be used that support curved screens (with functions like warping / morphing and blending). At this time, we will simply publish some photos to inspire you... (to be continued). This is a great website with a lot of valuable information given to all the aviators and person addicted by the aviation industry. I have a cockpit of a S76 completely stripped down with dual controls, pilot-copilot seats , instrument panel and so on in my garage. unfortunately it is taking some room. I am looking to sale it. do you know anybody who would be interested and where should I post the pictures? WOW, this is really great. Thank for all the time you put into it!